Syncroflo not only pioneered the concept of packaging pumps, but for more than 45 years has excelled at developing engineered products for this industry. 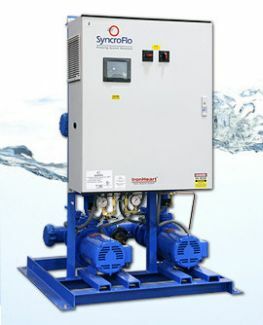 Through integrity and the utmost quality, SyncroFlo sets themselves apart from the rest of the competition in commercial water boosters, fire pumps, and HVAC pumping. 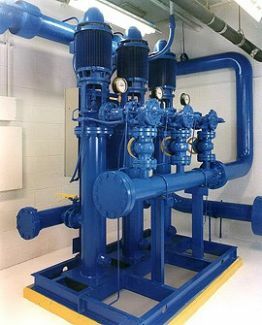 Domestic Water Booster Pump Since 1985, IronHeart has been the industry standard domestic water booster pump for commercial buildings up to 10 stories tall. We start with a series of high value close-coupled end suction pumps. We include the most essential features to the standard model. 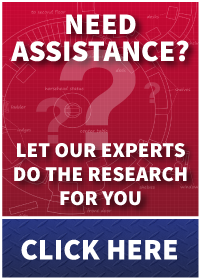 We offer the the most valuable options that engineers often specify. The result? A versatile product line that has a flow range of 100 – 800 gpm, and up to 100 psi boost. Now with over 200 models, in both vertical and horizontal configurations, the IronHeart fits most engineering requirements for a domestic water boosters used in a typical commercial building.